Rajeev Khandelwal is an actor known for essaying unconventional roles on TV, films and now in the webseries. The actor who can now be seen in the travelogue Rag Rag Main Ganga on DD National tied the knot with Manjiri Kamtikar on February 7, 2011. Rajeev first met Manjiri at a pub in Mumbai and it was love at first sight for him. The couple dated for quite a while before getting hitched. 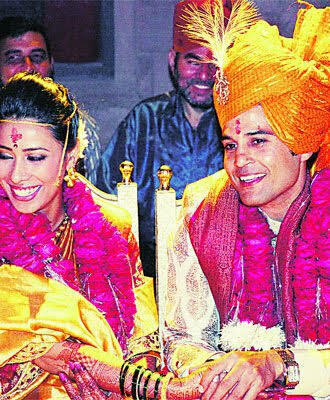 However, Rajeev proposed Manjiri only on the day of engagement. In the recent TV talk show Juzzbatt, Rajeev had shared how he had no choice but to tell her parents as media had got the whiff of their relationship. But all that is history now as Rajeev and Manjiri have now been married for eight long years and their bond continues to grow stronger. We wish the lovely couple a very happy anniversary. Click through the ‘NEXT‘ pages to browse further! These Pictures Of Erica Fernandes And Parth Samthaan At Siddhi Vinayak Temple Are Simply Adorable!